VEGAS.com, the world’s largest city travel web site, launches an exclusive way to get all the great perks of a local, by using the VEGAS Insider Card™. 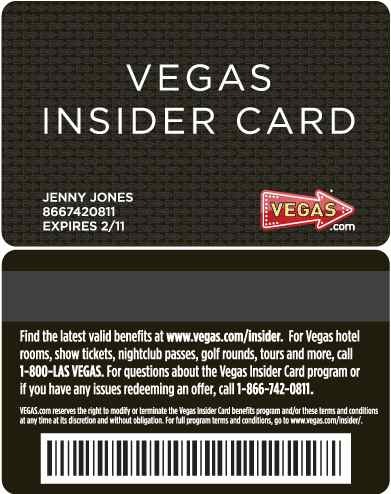 Travelers who make a purchase of $200 or more on VEGAS.com for any Vegas hotel stay, air/hotel package, show ticket, nightclub pass or tour will receive a personalized insider card to enhance their trip. By flashing their insider card, VEGAS.com customers gain special access to retail shopping discounts, show merchandise discounts, dining and drink specials, spa bonuses and more. Equipped with both a magnetic stripe and bar code, the card will tie back into future technological innovations created by VEGAS.com. The VEGAS Insider Card™ features countless deals and add-ons from dozens of hospitality partners in and around Las Vegas. Card members benefit from deals designed exclusively for them, and 24/7customer service provided by the local experts at VEGAS.com, should they need help redeeming offers or selecting activities. Those who qualify will receive the card in the mail before their trip date and can simply show the card at any participating partner for the desired deal or giveaway. To find out more about this program and see the most up-to-date deals, visit www.vegas.com/insider.